If you would like to enquire about booking an advert, or submitting a community news story, please email karen@aboutthetfordmagazine.co.uk or telephone Karen on 07540463662. Please see advertising rates page in the ‘more info’ section for details about our advertising rates. Discounts are available for repeat bookings. 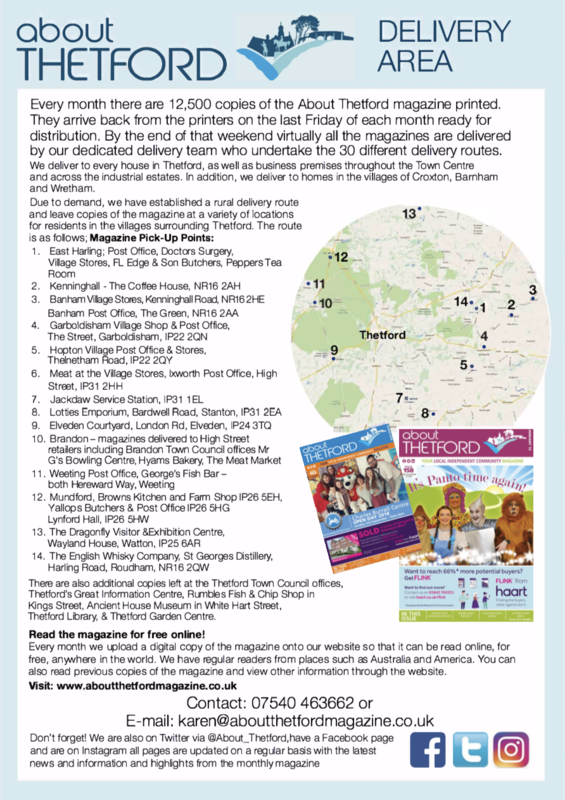 About Thetford Magazine has a strong social media presence, we are happy to discuss your needs should you only want to use social media. Please ask us for a quote. We are able to offer a very competitive advert design service for anybody wishing to advertise with the magazine. We charge just £10 for an 1/8th of a page advert, £15 for a quarter page advert or half page advert and £20 for a full page. Once the advert has appeared within the magazine you are free to use this as you wish or on any social media outlets that you may use. Our team of 27 delivery staff are keen to assist you with leaflet delivery. We charge £30 + VAT per 1,000 leaflets delivered. You can either opt to have material delivered to our entire delivery area (12,500 leaflets required), or ask for a specific area to be covered. The magazine is normally delivered on the last weekend of each month ready for the following month, with deliveries being completed within three days of receiving the magazines back from the printers. Any items to be delivered ideally need to be received a week prior to receipt of the magazine to allow us time to get them ready into the necessary delivery rounds.